We had a little bit of rain last week so I headed outside to capture some water drops. It's harder than it seems. Every time I would find a nice fat one, it would drip off before I had a chance to get it in focus. Here are a couple of the ones that stayed still long enough to capture. 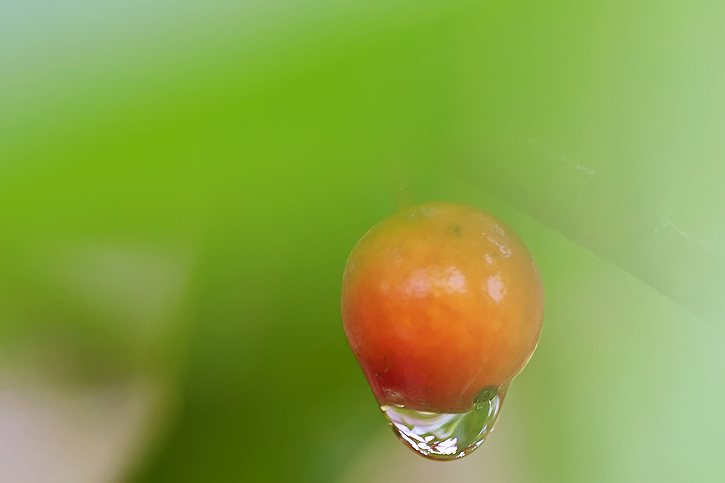 I got really close to the tiny berry for this one so the depth of field is miniscule. Love the shiny quality of the raindrops ... almost like jewels! Beautiful, Deb. Love the bokeh. These are wonderful water drops, Lovely. So pretty! I love the reflections in the droplets. Wonderful shots from a rainy day. It seems to be tears in your first photo. WOW! So gorgeous. Love these. You did a good job, so beautiful, I did try to capture water drops, but it is so difficult to get a nice one. I love the painterly feel to the first one! I love water on berries. So pretty. These shots are great. I can only imagine how close you had to get. Gorgeous. Oh my gosh these are so amazing I want touch the water on the berries! Love it. Your photography just amazes me,....simply amazes me!! Love your jewel droplets! I have quite a few of them too since it has been raining daily. Beautiful drops, they look so summery. Lovely......and it's what's inside that refraction in the last shot that interests me too. Are those white daisies? Wonderful captures as usual. I really like the blurred out second shot, puts more focus on the water drop itself. I love what is seen in the droplets themselves. And they can certainly be difficult to photograph! i love water drop pictures, i know exactly what you mean about getting them in focus at the right moment! I love your shots - I really like raindrop pictures there is something kind of magical about them!! I found you via my friend, Geneva's, blog My heart's Song. 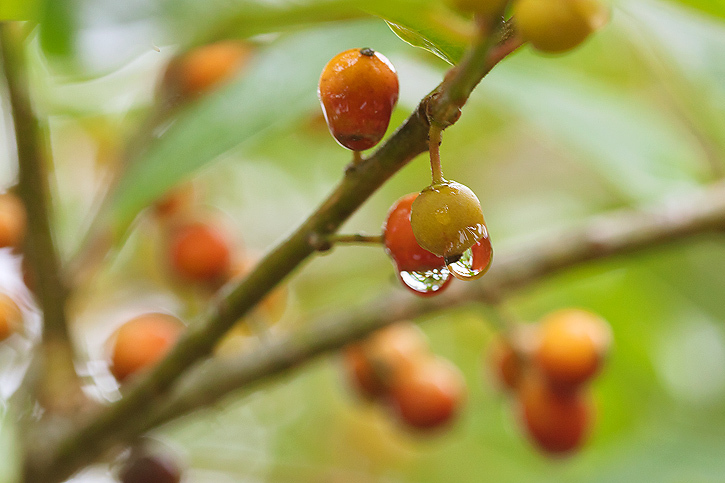 I love your photo of the water drops on the berries! I am following your blog now in hopes I can learn more about photography and seeing your beautiful pictures. 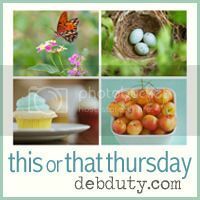 These photos are so gorgeous, Deb! The colours are so vibrant and that water droplet is fantastic! Fantastic water droplet shot- so clear. Especially love your second one. Thanks for hosting this link up. Amazing focus on those water drops! Deb, those are stunning!!! I love the green bokeh in the second picture, just stunning!! Oh that is really cool. As you know I love water drops too. We sure needed them! And could use some more. Hope you'rea having a great day! Your challenge appears to be going from strength to strength - well done! I love the water drop photos...they are so clear! Such beautiful photos, Deb! I love the way the rain drops look like they're about to fall off the berries but they're still hanging on there! Great, great captures. I love the macro shot with the drop just hanging on. I kinda love that you had to be patient to get these shots. ;) Very nice!! I feel your frustration with the water droplets. I was out in the woods in early morning and every time I pointed the camera at something with a water droplet on it, the wind would pick up. Ugh! BUT it's was still fun trying! BTW, beautiful photos! Excellent colors and dof! Great shots, water droplets are my fav! lovely macro! those drops look beautiful! It's good to back on blogger. I didn't even know you were hosting a photo challenge Deb! I guess I'm losing it Deb - I totally forgot to link up! I love those water drops and that last one is so crisp!! Lovely pics. Thanks for visiting my blog. Love that first one... So fresh and gorgeous!